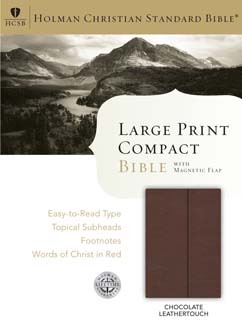 The HCSB Large Print Compact Bible has become one of the most popular settings of the Holman Christian Standard Bible translation. Readable and portable at a reasonable price, this edition featuring the magnetic flap closure slips easily into a coat pocket, briefcase, or purse and also makes a nice gift. It also features a presentation page, the words of Christ in red, end-of-paragraph references, eight full-color maps, a topical concordance, and several other study helps plus a two-piece die-cut gift box.